and it’s not just for one day or event, it’s over and again. And, even if you aren’t hosting, you have all those other festive events to attend. But that’s all for your personal and quasi-personal life. What about hosting a business event ? One that has nothing at all to do with the holidays, but everything to do with business? It’s nerve wracking, especially if you are organizing an inaugural event where everything from venue to speakers to content is new – and untested. We are both passionate about these books and the message each one offers women – of all ages, in all walks of life. 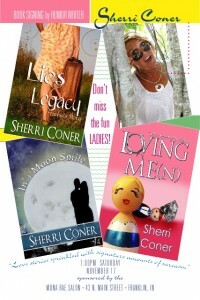 The books are about real life and perspective and humor and personal growth and power. As long as we have the opportunity to meet readers and reach out to them and share these stories – we’re happy. Yeah, we’d like to sell a lot of books – that would be great! Yeah, we’d like to build a huge fan base – that would be wonderful! Yeah, we’d like to have readers laughing and begging for the next book – that would be marvelous! But most of all, we want to have fun and share the joy that writing and producing these books has brought us. With each book that is published another dream is cast out there waiting to be realized. Not only the tangible product of a 398-page novel is impressive, but the way it touches people is absolutely amazing. It’s from one heart to another. My foyer and dining room are full of cases of books. The tables and linens are ready to go. Raffle prizes are all ribboned up and sign-in sheets are printed. Signs have been made and are packed to go. Press releases have gone out and we’re even slotted to be on Indy Style Friday morning, Nov. 16 at 9 a.m. So now that we’ve stressed over the planning and organizing and hosting, we’re going to just be what and who we are and share some laughs and a little of what fills our hearts with everyone who comes. Like most events, we know not everything will go as planned – or hoped, but that’s okay. Because events are just like Sherri’s stories and just like life – what is supposed to happen, will happen. We just do our best and have faith. 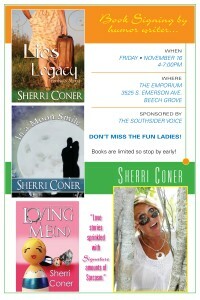 Join us to celebrate and laugh and giggle and share life’s stories! We will be there waiting to meet you! Friday, Nov. 16, 2012 from 4 to 9 p.m., Sherri Coner will be greeting fans and signing books at The Emporium located at 3525 S. Emerson Ave., Beech Grove. Saturday, Nov. 17, 2012 at 7 p.m., Sherri Coner will be speaking and sharing her own special brand of humor for women at Mona Rae Salon, 43 N. Main St., Franklin. Books will be available for purchase and signing. Life is an adventure, come join us on ours!